In 1984 it was determined that Atlanta airport's old administration tower was too close to the soon to be opened 4th parallel runway and could possibly pose a hazard to aircraft. It was announced in the media that the building was to be imploded at 7am on Sunday July 1st. A large crowd was in attendance along with several TV crews and at least one live radio broadcast of the event. At 7:02am the Atlanta landmark that took over a year to build came crashing down in less than 5 seconds. My dad and I went to the airport to witness the demolition of the tower. Here's the video I shot that morning on grainy VHS. 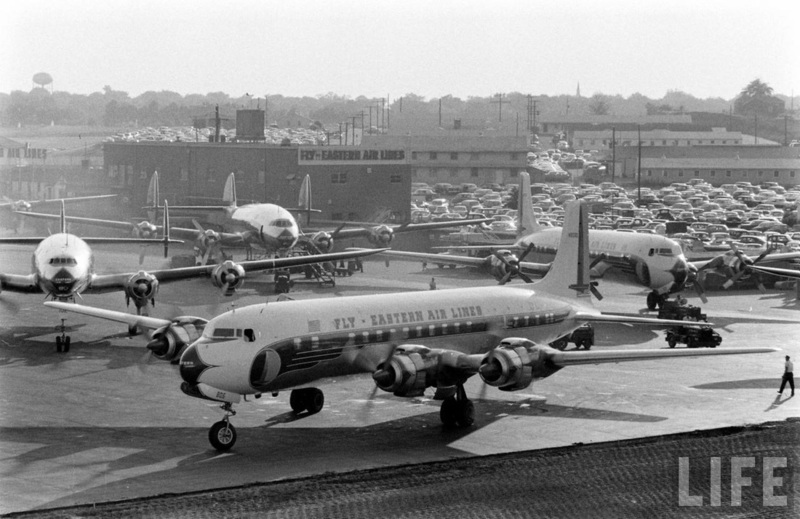 The brick building at the beginning with the "FLY - EASTERN AIR LINES" sign was a holdover from the 1948-1961 temporary terminal and can be seen in this photo from 1956. The close-up shot of the tower shows that the letters spelling Atlanta had been removed and that several windows were already broken. After a barely audible countdown and loud explosion, the building seemed to simply fall over backwards onto what was once the aircraft apron. From our perspective directly in front of the terminal, the tower seemed to sink into the ground. The crowd quickly dispersed as the thick dust cloud drifted over the parking lot. Here's a silly live remote of the demolition that perfectly conveys the sense of nostalgia combined with the party atmosphere of the event.